My first idea is based on the restaurant opposite my house. It is an Italian restaurant, with a Spanish name and run by eastern Europeans. I am convinced it is a money laundering scheme to help get the dirty money into the system. My environment would be set behind the scenes in the kitchen area, away from prying customers eyes. The area will be modeled to look like a working kitchen, with animations of bubbling pots; with steam and smoke rising, swaying utensils, shouts of the chefs and a few subtle hints as to the real purpose of the restaurant. These could include a mysterious black case placed on the surface by an unseen person, a door at the back of the room slightly ajar with dim light and muffled voices or suggestive lighting to show the more devious side. I have taken reference from two video games to help support this idea, the two games are Grand Theft Auto IV and Mafia II. I chose both of these as the both revolve around organised crime. Mafia II, as the name suggests is about the mafia, I’m using this as reference because I will be able to see different environments gangsters are in and how they cover it. I chose GTA IV because the main character is from Europe and may give and insight into how a organised crime is orchestrated over seas. Below are some images of restaurant and cafe environments from Mafia II. Mafia II is set around the 1930’s and 40’s which can be seen in the characters clothing and from the decor of the rooms. This can also be seen in the low, orange lighting and heavy use of wooden textures. Although these are not all the features I would have in my scene, they are important for setting the mood for the story. My scene, being set in more recent times, will have cleaner, brighter surfaces; white and brushed metal but still with the mafia presence, possibly with trilby hats and trench coats. My second idea was inspired by my visit to Morocco, Marrkech to be more precise. Within the centre of the city is the Medina, a walled off part of the city where no cars are allowed. The Medina consists of small winding alleys and pathways, bustling with the daily traffic. All the buildings are painted a distinctive shade of orange. From the buildings emerge small artisan market stalls, selling a wide variety of products; colourful spices, hand-made toys, sparkling tea pots and barrels of fresh squeezed orange juice. My narrative unravels at one of the artisan stalls, hidden in the shade of hanging cloth and obscured by the smoke of incense, the shop could be easily missed, unless you were searching for it. The shop is owned by a character not to dissimilar from Jafar in Aladdin, selling objects and trinkets, he describes as being magical and mysterious when, in fact, they are just normal house hold items, with dust and rust to make them look more authentic. This idea was inspired by some of the shop owners we met whilst away. They would wear these authentic blue robes and turbans and own shops tucked down the back alleys of the Medina. They would offer stories for the items they were selling to entice customers into their shop. I fell prey to one of these stories and ended up buying a teapot which he convinced me was an antique, when really you could walk up the street and purchase a brand new one for half the price. My environment is inspired by the Medina of Marrakech and Essouira. A Medina is typically walled, with many narrow and maze-like streets, Because of the very narrow streets, medinas are generally free from car traffic, and in some cases even motorcycle and bicycle traffic. Some medinas were also used to confuse and slow down invaders because of how narrow and winding they are. They are also a good example of how forts have developed into a place for the public. Below are some images of the Medinas mentioned above, notice the the very distinctive colours between the two. Marrakech uses an orange brown within the city and all its buildings, this is from the clay that was orgionally used to build the city, nowadays they use more conventional forms of construction and just apply an orange paint. The colour orange is also mirrored in Marrakech’s notoriety for oranges and orange juice. Essouira on the other hand, a city next to the sea, is made up from two colours, white and blue, this is reflected by the colours of the blue sea and sky. The Blue is a colour Morocco is famous for , it is called Majorella Blue and can be seen throughout Morocco not just in Essouira. Here are also a collection of photos from my travels that I feel best represent architecture and mood of my scenes. I noticed there is a big emphasis on the use of archways to connect different parts of the city together; canvas shades, across alleys and over market stalls, I will be incorporating this into my scene. Not only these, but also, because Morocca is a Muslim country, there are no paintings depicting animals and humans, instead there is a lot of use of repeated geometric patterns and Arabic calligraphy, I will be researching more into these later as I believe they will be a vital aesthetic in my environment. The ‘metaphorical mask of normalcy” is a key part of of my characters personality, I plan for there to be an almost facade of this mystical magician, selling his magical wares, when really he is just a con man trying to sell broken and busted items for an inflated price. Below are some concept art and screen shots from the film that best represent the Arab style and architecture, similar to what ill be trying to achieve in a 3D environment. The style of Aladdin’s architecture is a bit too stylized for me, so I will be reducing it down for when I make it, they are just good reference for the colour, scale and design. There is heavy use of domed buildings, archways, canvas sun shades, bustling market areas, small glassless windows, deep orange sunlight and crenelations on top of the buildings. Here are my concept pieces for this environment , the first image depicts the the opening scene, shot outside of the shop, in a shadowy back alley. I chose an out door scene first to inform the viewer of the location, with a slow zoom up to the second shot. This shot is to look mysterious, only revealing a small portion of the room and flickering light. My next idea is set in a land before time, back when woolly mammoths and Neanderthals roamed the planet. Our story will be set in the cave or ‘home’ of one of these Neanderthals, but it is no ordinary Neanderthal, he’s not even a Neanderthal at all, he’s an impostor, posing as a cave man. He has been sent back in time, set with the task of helping mankind flourish and prosper, through the subtle introduction of basic technologies, such as fire, the wheel and traps. It all must be achieved before a certain date, judgement day, before it is too late for the mindless Neanderthals to survive the impending ice age. The environment will consist of the façade of the impostors cave, animal pelts draped over rocks, scattered bones and a make shift sun shade with a smoldering fire beneath. Within the cave is a similar story, rudimentary paintings on the wall, discarded bits of clothing and a pile of fur for bed. The deeper you go into the cave, the story changes, objects you wouldn’t expect to see; books, pens and paper; a calendar on the wall with a date circled. From the far end of the cave a muffled whirring can heard and a faint blue light seeping from behind a thick fur curtain. The time machine. During my research I have discovered that there is more than one species of humanoid developing around the same time as modern Humans. They are put into three groups Humans, Neanderthals and Archaic Humans within these three groups are separate sub species. The human group is divided by Homo Sapiens Sapiens and Homo Sapiens Idaltu, Homo Sapiens Sapiens being the species that still exists today. They can be traced back to about 110,000 years ago but the more refined and developed H.S. Sapiens or ‘Modern Humans’ is dated to about 10,000 years ago, which coincides with the end of the last ice age. At this point the human population of the world switched from a culture of big game hunting to smaller game and later, an initially tiny proportion, began to exploit wild grains and starchy plants which could be stored. This led to increased sedentism, increased local population density, and eventually, by at least 8,000 years ago, to the domestication of plants, as well as livestock species of animals, and then to mixed intensive agriculture. With higher population densities, better tools and fewer demands for brute strength, people all over the world became less robust, resulting in the comparatively more gracile population of today. Thus, anatomically modern humans can roughly be divided into two groups, the early (robust) and post-glacial (gracile) populations. The process leading to the development of smaller and more fine-boned humans seems to have begun at least 50,000 – 30,000 years ago. These are the characteristics I am going to try an incorporate into my scene as objects and ideas that the time traveling is going to impose onto the existing Human populations. My environment is going to be set in the cross over stage of a new ice age. Below are some images to help me understand how a cave environment looks in a wintery setting. the use of colour in these images is important, the all use blueish tones to represent a feeling of coldness with a sharp contrast with white and back for the snow and rocks. In the third image the snow is on the floor with the rocks poking out the top, this leads me to believe that the snow has been there for a while, whereas in my scene I will have the snow just covering the tops of mountains to suggest that it has just freshly fallen and it is too warm for it to fall lower down the valleys. These first two images below are a good indication of the scale of my scene, I want the walls and ceiling to be quite low, to give it a more homely feel, when compared to the last two images and their vast caverns. These two, a scene from ‘The Croods’ and ‘Ice Age’ concept art, better represent the characteristics of a cave that I want to include in my environment. I am going use ‘The Croods’ as a reference for my environment, this was the obvious choice for me because it is an existing animation set in the same time period as mine. I also like the cartoon, soft style, as opposed to a more realistic style, which would be more tricky. Here I have taken screenshots from the film that best capture the environment. I’ll take reference from the style of rocks and from their home, the way it consists of a single rock slab roof. I also note the style of the art on the wall, lots of hand prints and basic creatures, all done in a brown-red colour. This can be seen better below. Other than the Environment, ‘The Croods’ has good examples of fire and how the light interacts with the rest of the scene. I will be having fire, both inside of the cave and outside of the cave, so these three scenes below will be a good reference point for the effect I am trying to achieve. Here are some concept pieces for my idea, I have a created these with the intention of giving a rough outline for the setting of each scene, plus representing the mood through the use of colour. I have used a technique similar to the story boards from ‘The Incredibles’ which I came across in my book ‘The Art of Pixar’. I have used this style because my drawing skills are not fantastic and this is a quick and effective way of outlining my story. What industry roles interest me? After a bit of searching, a few roles have started to stand out to me, these are; character animator, effects animator, animator, VFX artist and concept artist. I plan to look into all of these different positions to gain a better understanding and see what interests me to look deeper into. Before starting on the course, being a visual effects artist was a field that interested me greatly and still does today. My interested started when at college, Double Negative came in to our college and gave a presentation on working within the VFX industry. They spoke about all the different pathways within the company, from concept artists to compositors and the process of becoming a member of the team at DNeg. Most people start out as a runner, delivering post, grabbing coffees, printing just being an all round helper. Currently on the DNeg website they are offering positions as a 2D or 3D runner, and from being a runner you are promoted to your field of interest usually after 12 months. My final idea is set on a microscopic level, within the body of a human. The scene will be of a virus’s lair with a narrative of his plot to take over his hosts body. The idea was inspired by inside out and Rick and Morty’s Anatomy Park. The lair would be inside on of the organs, glistening red walls with pulsating veins and arteries running throughout. There will be a very sinister mood suggestive of the impending doom. On top of the surfaces, molded from the same material as the walls, will be the virus’s utensils, darkness emitting from them, seeping into the organic material and open books detailing the methods of infection. In the corner is a dark hole, leading far into the distance, the infection spreading up the walls around and within it, this is virus’s exit point to spread its poison throughout the body. I have chosen to research FX artists as one of my industry research pieces because visual effects can be used to enhance existing environments to make them more immersive for the audience, especially with the high increase in photo realistic VFX we see in movies today. I want to look further into being a FX artist because it is a field of the industry I am greatly interested in pursuing as a job prospect in the future. An interest that has only increased after our recent visit to Double Negative, where they gave a presentation detailing what the company does and what they’ve been working on, but more importantly the job opportunities and how to get there. This lead to me to look at the job opportunities on their website and what is required to be FX Technical Director. They indicate that someone needs to have a good understanding of both Maya and Houdini to produce effects such as, smoke, fire, clouds,water,steam and explosions, plus experience using particle and voxel based systems. They also state that you need to be able to produce these effects to a photo realistic standard. It is not the FX artists job to create an environment, but it is however their job to create certain aspects of the environment that bring it to life. We can see here in this clip from ‘Into the Woods’ how the particle effects are vital in creating the environment and making the scene believable. In the scene it would be the FX artists job to create the smoke and dust swirling around the character, using a combination of a particle system, to create the swirling motion and fluid dynamics to create the physical smoke from those particles. It would then be passed on to the compositor to layer all the different elements on top of each other. ‘The Revenant’ is another great example of where VFX has been used really enhance the scene instead of distracting the viewer from the action. Although you may not associate ‘The Revenant’ with outstanding VFX, it does have some truly inspiring moments, most notable being the bear fight scene. ILM handled the majority of the VFX and MPC and Cinesite were charged with the opening and closing battle scenes. ‘The Revenant’ was nominated for an Oscar for best VFX and only beaten by the slick, clean, VFX in ‘Ex Machina’. The reason ‘The Revenants’ VFX is so inspiring is the inability to see it, there is a great subtly to the effects, which makes it so believable. They have only used CG were is is 100% necessary and with a combination of live action and CG the have seamlessly blended the two together. 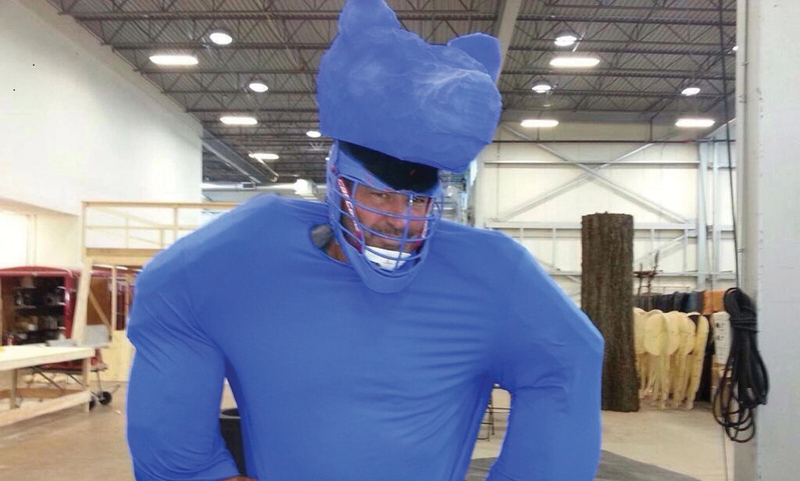 Even in the bear fight scene was first filmed with a stuntman in a blue bear suit fighting Di Caprio, this brought emotion to the scene, in terms of movement, in terms of shadows, lighting, contact, and an actor’s reactions to another actor’s performance. The CG bear was then added over the top to mimic the stuntman’s movemment. Here is a job posting from double negative for the position of VFX TD, a position a few rungs above an artist or junior artist. Job Description: FX Technical Directors gather a variety of 3D assets produced by our Build, Layout and Animation departments and use off the shelf software – primarily Houdini but also Maya – and custom pipeline tools to create particle, rigid body, fluid, cloth, fur and hair simulations. -Use an array of commercial and proprietary software tools to produce photorealistic simulations of real-world phenomena while developing innovative solutions to complex problems. -Create bespoke effects setups to fulfil client briefs. Produce test and often final renders of FX elements for a shot. -Create working test composites for review by the supervision team. Work in partnership with lighters & compositors to ensure shots are delivered to the very highest standard. -Proven experience in producing effects such as smoke, fire, clouds, water, steam and explosions, plus experience with particle and voxel based rendering. -An eye for details, good sense of timing, and thorough understanding of techniques and technologies relating to physical simulation in computer graphics. -Experience in live action FX work preferred. -Extensive knowledge of Houdini and/or Maya (Python, Hscript or Mel knowledge a plus). Primarily the route into the business is to start out at a runner position, and with the aid of a mentor eventually move up to a junior position and beyond. Being a runner can be tough, working long hours and attaining to everyone’s needs from coffee to post, on top projects given to you as part of the mentoring process. However it is a necessary step on acquiring the knowledge and experience needed to move into a higher position within the studio. This book outlines many different techniques used by concept artists to create their environments. Below is an example of how to use grid lines as a guide to create depth of field and distortion in your images. These I have found to be and effective tool when creating my own concept images for one of my ideas. A compositors job is to construct the final image by combining all the various assets from models and animations to special effects, graphics and backgrounds. This is usually done in such a way that the viewer believes all assets are part of the same scene. There are a few types of compositing in the film industry. The first being the traditional methods of physical compositing, multiple exposure, background projection and matting, all done on, or for use with, film. Next we have digital compositing where all these traditional methods are combined into one package, normally After Effects or Nuke, primarily Nuke for films as it gives the artists more control due to its node based system, whereas After effects uses a layer based system and is used more in advertising or motion graphics. I will be focusing more on digital compositing as it is an area much more relevant to me and the course. As I understand the process starts off by importing rendered images from something like maya or houdini, as an EXR file so you are able to extract the the multiple channels, diffuse, ambient, shadow etc.. Also importing any other assets from matte paintings to live action and laying them all to achieve the look you want. A compositor should have a good understanding of how to manipulate colour to achieve a certain mood and also a good eye for setting up and adjusting lights within nuke. As I mentioned before Nuke is primarily used over after effects in the film industry as it gives the artists more control over different aspects of the scene. The node based system makes it much easier to create effects at certain points in the pipeline, it also makes it much easier to alter these effects on each seperate node, whereas in after effects you need to drag back through mutliple pre comps to find and edit effects, whilst trying to to alter anything else in the scene. A relatively new innovation in the world of compositing I have found quite interesting is the art of deep compositing. Rather than layering multiple 2D images ontop of each other and using mattes and masks to manipulate them, deep comping creates a rendered image, that doesn’t just have a single Z depth for a certain point on the image, but instead it has an array of values that define the distance of each pixel relevant to a certain point in space. Basically giving the pixels of an image a position within a 3D space, thus allowing for compositors to place other assets inside the image without having to create multiple nodes or layers with separate masks. Here is an example of deep comping being used in the ‘Orrery’ sequence in ‘Prometheus’. We can clearly see how each particle in blue has its own depth in the image as each particle passes in front and behind each other encasing the actress in the middle. This allows for a lot more realistic effect making the scene more believable for the audience. • Minimum 5 years photo-real compositing experience in both episodic television and feature film projects. • Strong understanding of color, colorspace and grain. • Expert knowledge of compositing, including channel manipulations, grain and integration of CG elements.